(NaturalNews) It is not a big secret that the processed food industry thrives on selling people junk foods made from cheap, addictive and often synthetic ingredients. However, a major loophole in the regulatory system has made it easier than ever for junk food manufacturers to also add hidden trans fats to their already unhealthy products, with more than one-quarter of all supermarket foods now ridden with this artery-clogging poison. A recent analysis of the Environmental Working Group's (EWG) comprehensive Food Scores database showed that at least 27 percent of the more than 84,000 foods cataloged by the consumer watchdog group contain artificial trans fats, which are lab-created synthetic fats that clog arteries and cause heart disease. An additional 10 percent of foods in the database likely contain the toxic substance in disguise, says EWG. The EWG Food Scores database is an amazing tool for assessing the nutritional value, toxicity, and processing methods of tens of thousands of commercial food items. The online tool, which is also available as a smartphone app, uses advanced algorithms to classify and compare the quality of foods based on their stated ingredients as well as their likelihood of containing genetically-modified organisms (GMOs), pesticides, antibiotics and various other additives. 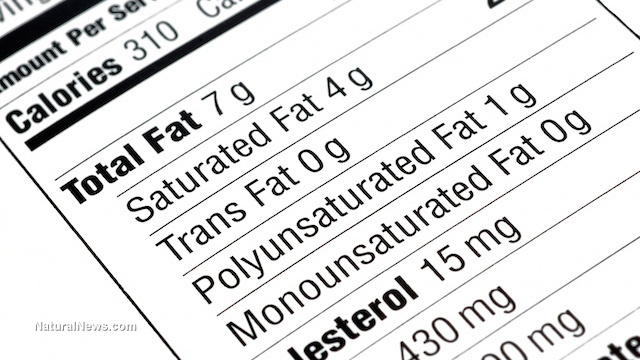 The information contained in the EWG Food Scores database is invaluable, especially when it comes to the issue of trans fats, which aren't always identifiable on food labels. This is because the U.S. Food and Drug Administration (FDA) allows processed food manufacturers to label their products as containing "no trans fats" when they contain half a gram or less per serving of trans fats. What this means is that processed food manufacturers can simply reduce the serving size of whatever they are selling in order to keep it under half a gram per serving of trans fats. 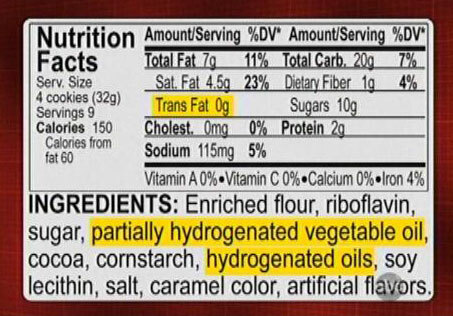 This explains how one nutrition label can claim "Trans Fat 0g," even though the ingredients list contains partially hydrogenated vegetable oil and hydrogenated oils, both of which are trans fats. "EWG found that 87 percent of the over 7,500 foods containing partially hydrogenated oils -- Americans' principle dietary source of trans fats -- didn't disclose that fact," says EWG, noting that only 2 percent of the foods in EWG's database admit on their labels that they contain trans fat. "Instead, the labels of more than 6,500 of these items rounded off their trans fat content to 0 grams." Surprisingly, the FDA actually wants to remove trans fat from its "generally recognized as safe," or GRAS, designation. If this ever happens, food manufacturers would have to gain specific approval from the agency in order to use trans fats in their products, which would also require providing adequate justification for such use. Since the science is clear that trans fats provide no health benefits and are actually dangerous, this would be a tough sell. Technically speaking, trans fats belong on the Drug Enforcement Administration's (DEA) Schedule I list of drugs or other substances that have a high potential for abuse (think binge eating on Little Debbie snack cakes and Twinkies), no currently accepted medical treatment use (trans fats kill) and a lack of accepted safety. If anything should be prohibited in this country, it's useless and deadly substances like trans fats.